If we've got any Gator fans in the greater Tampa area here, so it seems, no less than Rome's taken to rubbing in Saturday night... while the Florida State crowd down there can just keep chopping away. At Roman Noon, less than 36 hours after a fourth straight FSU win at the annual in-house faceoff, the Pope transferred the church's Chief Nole, 52 year-old Bishop Gregory Parkes of Pensacola-Tallahassee (above), to the Sunshine State's second-largest market as the fifth bishop of St Petersburg, succeeding Bishop Bob Lynch, the venerable USCCB titan of three decades who reached the retirement age of 75 in late May after 20 years at the helm of the 475,000-member church. 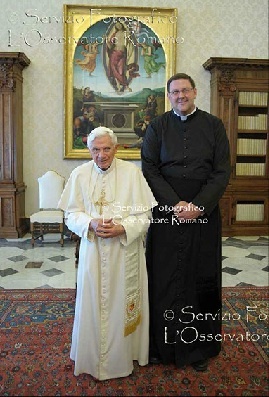 At the same time, the move indeed presents a study in contrasts: a quintessential son of the "John Paul II generation" of priests – a NAC product and Gregorian-trained canonist – coming to succeed one of the Stateside bench's most formidable and influential progressives, whose clashes with the church's right flank (even into recent weeks) have more than occasionally borne all the intensity of SEC rivalry at its finest. Per long-standing plans he shared nearly a year ago, the onetime General Secretary of the national bench intends to leave the diocese for a year on the evening of his successor's installation to allow the new prelate a fresh start, and likewise to fold The Mother of All Episcopal Blogs, which has consistently provided the most candid public reflections of any American prelate since its inception in 2008. A 10.30am presser has been called, possibly to take place in St Jude's Cathedral (above), which was rededicated in 2013 following a $9 million expansion and complete overhaul. As Parkes' installation date remains to be announced, per the norms of the canons, it must take place within two months of this morning's appointment. 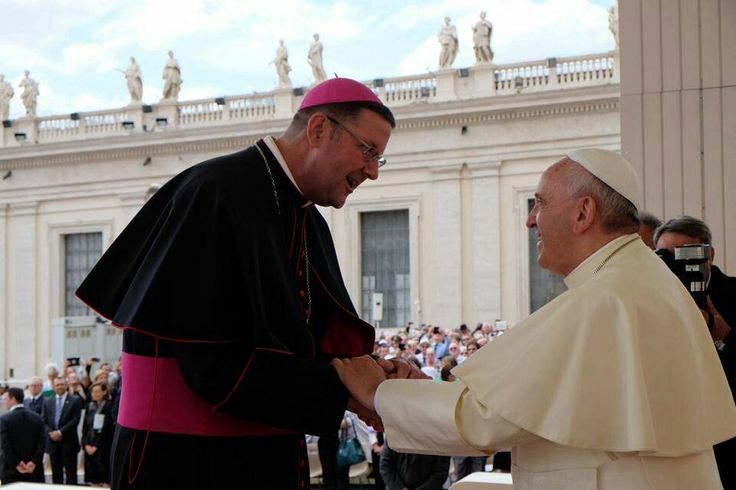 SVILUPPO (11am): Held not at the Cathedral, but the Chancery, the press conference saw a clearly exuberant Parkes introduced by an emotional-as-ever Lynch, whose voice cracked as the retiring prelate spoke of his "joy to pray this morning for Gregory, our bishop." More of a generational handoff than most given the 23-year spread in age between predecessor and successor, both bishops remarked that the appointment represents a sort of homecoming for the Pope's pick: as a rising banking executive in his early 30s, Parkes lived in Tampa and discerned his vocation at the city's Christ the King parish, one of the largest communities in the diocese he now inherits. 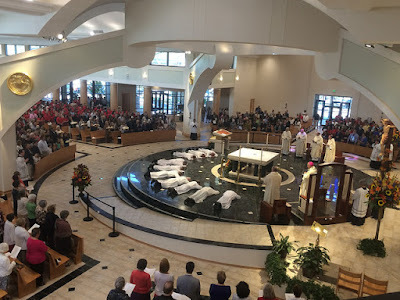 In an unusually quick transition, Parkes announced that his Installation will take place on Wednesday, 4 January – a date picked due to its confluence with the usual yearly retreat for the bishops of the Southeast at the St Pete church's crown jewel: the diocese's Bethany Center, which has become known as one of the nation's finest retreat facilities.